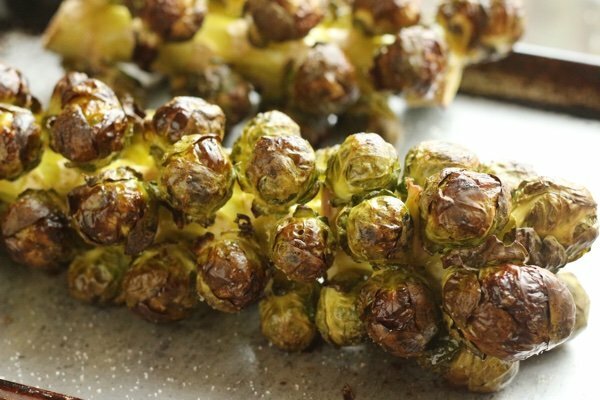 Do you know how to roast Brussels sprouts on the stalk? I have always cut them off to cook them but it turns out that it isn’t necessary or even a good idea. I saw this stalk at Trader Joe’s and at my local grocery store so I am hoping that the entire country has access to this crazy thing. Yes, that is right. This baby is almost 2 feet long! You pick up the stalk and put it in your cart – no bag required. I couldn’t fit it in my fridge so it hung out on my counter. I decided to see if it could make it to my Thanksgiving sides Hall of Fame which includes simple glazed carrots and balsamic roasted green beans. But first I would have to see if it fit in my oven. As you can see, it makes it in the oven but not on my large rimmed baking sheet. No worries! You can cut it into pieces very easily. It is a little tougher than broccoli. The preparation here is a little olive oil and salt and pepper and right into the oven. You end up with this kind of extraordinary trunk of yummy sprouts that can be served at the table just like this! Isn’t this cool? Put it on a serving platter without adornment and you will hear a sigh of amazement. How did you do it? Now the vegetarians at your Thanksgiving table will have something to carve! Hand along a paring knife with the stalk and people can cut off what they want to eat. If they are already a bit tipsy, you can cut the sprouts off for them. Of course, if you have Democrats and Republicans at the same table and you allow politics to be discussed at Thanksgiving, you may want to stick to plastic knives or blend the food with a high power blender and have Thanksgiving smoothies. Do not try to eat the stalk as it is quite woody. 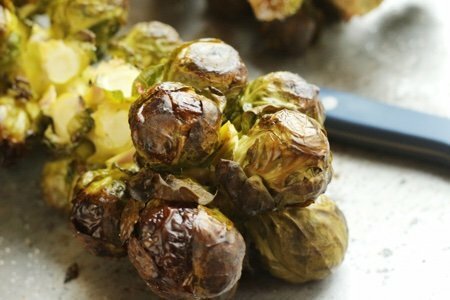 Have you tried roasting Brussels sprouts on the stalk? Please share! 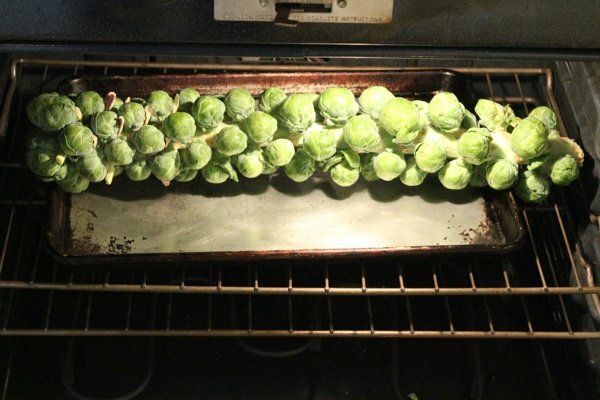 Heat oven to 375 F. Rinse off stalk and trim the tough leaves that you find in between the sprouts (if there are any). Place on a rimmed baking sheet. If the stalk is too long, cut it in half and place both halves on the sheet. Brush with olive oil using a basting brush. Turn it over to ensure that all the sprouts are covered and then sprinkle with salt and pepper. Roast for 30 minutes and then rotate the stalk to ensure even cooking. Bake for another 20 minutes until sprouts can be pierced with a fork. Remove sprouts from stalk with a paring knife. This is SUCH a cool idea!! I am totally making this! 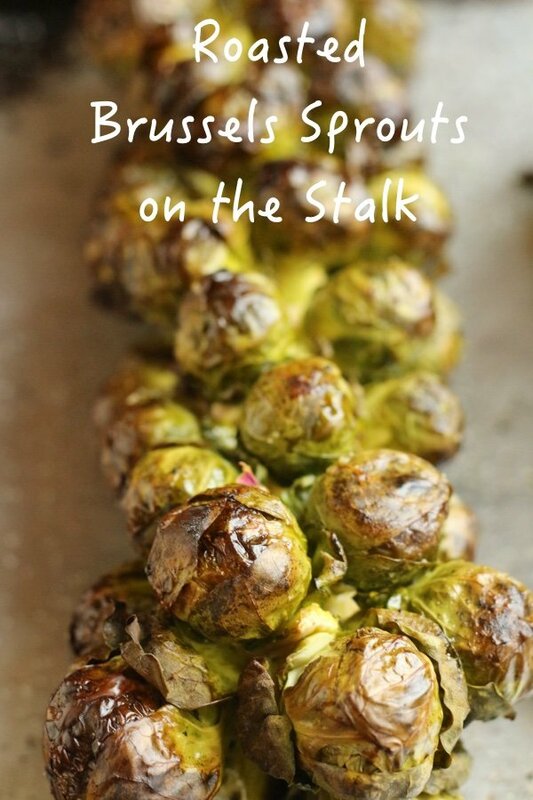 I bet the brussels get extra cruncky on the outside since they're spaced out so nicely. Yum!! When I first noticed these at our local Giant Food a few years ago, the checker didn’t know how to ring them up! Trader Joe’s never had a problem! I always cut them off the stalk, but I can see now there’s no need. Thank you! What a great way to cook them. Need never thought to leave them on the stalk. What a great idea! I've never roasted them like this, but I have thought about roasting people like that who have talked about politics at my Thanksgiving table. Definitely a "No politics" time! This is amazing! A must do. Especially this year, my daughter is hosting TG for the first time and is very excited about it. It's to be a totally vegetarian menu with one fish exception. This stalk of sprouts will look so festive and rustic with a big ole knife sticking out! I'm not worried about a political disourse, thankfully we're all in agreement on that front. Thanks so much for your fresh ideas Lisa! Looks like fun - I'd use garlic salt instead and throw a little rosemary from the garden. Spray olive oil would be easy here! I've heard that if you don't trim sprouts enough they can be terribly bitter. Was that not an issue doing it this way? @Heather - I found that these were quite sweet on the stalk. I eat them a lot and have never had a problem. Thanks for your question!